West Torrens Birkalla and MetroStars reach their penultimate match on their road to the Westfield FFA Cup SA Final, when they meet at Adelaide Shores Football Centre on Tuesday night. Both sides come into the game having suffered a loss in their last PlayStation 4 National Premier League outing. And their position on the league ladder will count for nothing for these two proud sides, who will be striving for a chance to win some silverware for their trophy cabinet and opportunity to play on the big stage in the National Round of 32. Birkalla have been unpredictable this season. On their day they can be a destructive unit as they showed a fortnight ago in their 6-0 demolition of Adelaide United. It will be up to their coach Steve De Giovaniello to build inspiration in the locker room before the kick off if they are to progress further. The two sides boast solid defences. Tom Dittmar and Adam Le Cornu, have been consistent contributors as Birkalla’s central defenders, and their output on Tuesday night will be instrumental in deciding the outcome of the game. On the other side of the ledger, Michael D’Aloisio and Tim Henderson have been equally impressive in MetroStars’ back half and have proved to be ruthless in their defending. The battle in the middle of the park promises to be a highlight with MetroStars trio Fabian Barbiero, Anthony Sologna and Liam Wooding going head to head against Lawrence D’Arrigo, Jake Monaco, and Kristin Konstandopoulos. Monaco was in sparkling form for Birkalla in their recent 2-0 triumph over Croydon and again on the week-end against West Adelaide. The hard-working midfielder will be right in the thick of things from the first whistle. 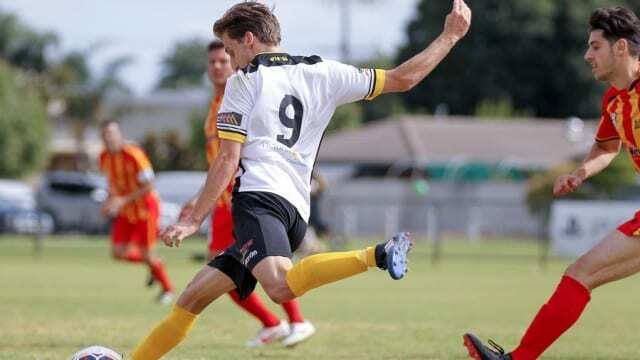 Barbiero and Wooding have been in fine form of their own for MetroStars of late, and they may do enough in assisting Christian Esposito, and Mathew Dawber in their forward half during the course of the game, to give the Klemzig side the edge. MetroStars defenders will need to be wary of Birkalla’s dangerous duo up forward in Taro Kawamura and Fumiya Suzuki. The two have an uncanny chemistry between them with their bag of tricks, which have caused opposing defences a lot of problems. Don’t be surprised if this contest is decided by a period of extra time, due to the evenness of the two squads. But MetroStars should have enough polish in their game to get the job done and progress through to the Final for a showdown with either Adelaide Blue Eagles or Adelaide City. Broadcast information: 531am, Radio Italiana website or the TuneIn App.